Create a short narrative film with a clearly defined conflict showing the main protagonist attempting to overcome or solve the conflict. I started the writing process by looking for ideas that would challenge me creatively and be practical enough to make into a short film. In particular, I was looking for ideas that were grounded in real life situations, preferably some kind of life struggle involving two characters that could translate into an authentically told story on screen. I began by gathering ideas for the assignment from a range of sources, including newspapers, online magazines and human interest websites, and even found objects. After I had gathered a dozen or so ideas, I sifted through them, discarding anything too complex and more suited to a longer film, too superficial, uninspiring or lacking in scope visually. This left me with two potential ideas: one based on a found object and another drawn from a story on ‘Humans of New York’ website. Taking these two initial stimuli, I then generated further ideas by clustering, a strategy suggested by Linda Anderson (2005). 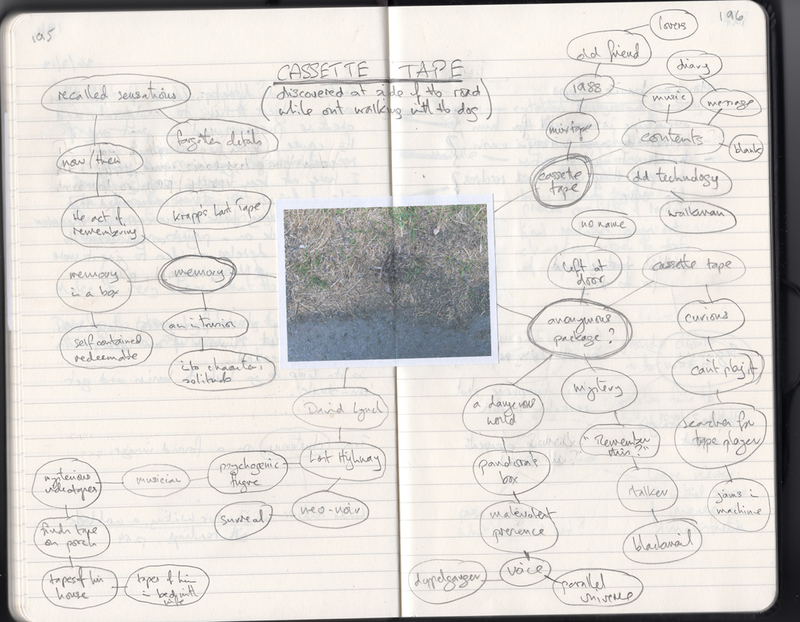 The first ‘cluster’ on the found object, a coil of cassette tape found at the side of the road while walking the dog, and then a second ‘cluster’ on the story of a mother and daughter I had discovered on the Humans of New York Facebook page towards the end of the gathering process. This idea is the result of finding and photographing the insides of an old cassette tape found at the side of the road. Samuel Beckett’s play ‘Krapp’s Last Tape’. I like the idea of a Neo-noir story built around memory and the act of remembering. Drawing upon some of these ideas could make a visually interesting moving image with quite dark undertones. It could also result in a film that challenges the viewer intellectually. This idea is based on a story posted by Humans of New York (2018) on its Facebook page. 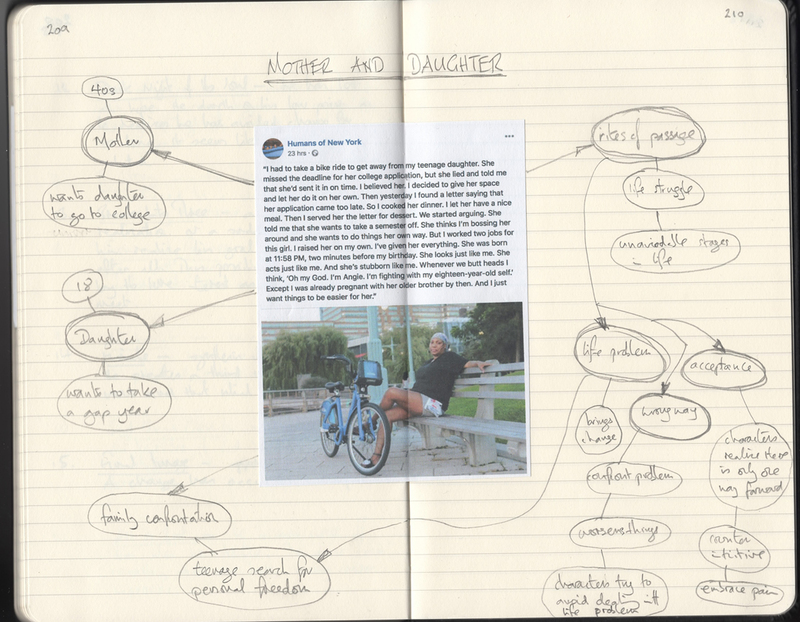 Brainstorming around the story of the mother and daughter generated a very different set of ideas than those of the old cassette tape. One that was in keeping with my original notion of using a real life situation. I liked the idea of the mother cooking dinner for her daughter, letting ‘her have a nice meal’ and then serving ‘the letter for dessert’. I would probably not use the bike ride. Containing the story within the family home rather than taking it outdoors would create a more pressured feel to the moving image. Both stories have potential for being developed into a moving image. Weighing one idea against the other, I decided to file the ‘cassette tape’ idea away for future project film development and focus on the story about the mother and daughter. There were two things I particularly liked about this idea: the image of the mother serving her daughter with a letter for ‘dessert’ and the rite of passage inherent within the story. The mother’s rite of passage is the realisation that her child is now a young woman with a life of her own. The daughter’s rite of passage is that of personal freedom. There are several layers of conflict within this scenario. There is an inner conflict within each of the two characters. There is also a conflict between the two characters. I found a couple of points in Patrick Nash’s book on writing short films particularly helpful at this stage. ‘A well-scripted short film can deliver a short, intense burst of emotion’ (Nash 2012, p.110). What drew me to the original idea was the slow build up to an intense burst of emotion in the mother and daughter’s argument and the daughter’s final outburst and storming out of the house. ‘The character has little or no time to change significantly except for perhaps a dramatic revelation or sudden insight into his condition at the end. Interestingly, in some shorts the protagonist actually causes other characters to change while he himself remains relatively unchanged’ (Nash 2012, p.92). 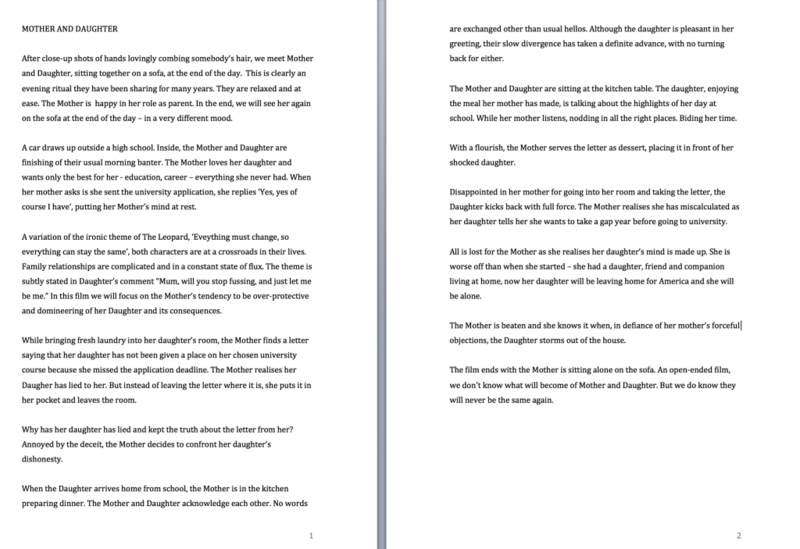 This idea was useful in that it fits the story in ‘Mother and Daughter’. It quickly became clear that in this particular story that, through her actions, Mother causes Daughter to ‘change’. The first step in developing the story was to write a logline. In the online article ‘How to Write a Logline: The Ultimate Step-by-Step Guide’ (Script Reader Pro, 2018), the logline is described as the story’s core conflict summed up in one sentence, containing three elements: ‘Protagonist + Struggle with Antagonist + Death Stakes’. However, crafting the logline with this in mind was not as easy as it looked and required a considerable amount of trial and error to write. Identifying the ‘Protagonist’ and ‘Struggle with Antagonist’ was fairly straightforward. Finding the ‘Death Stakes’ was harder. It was only after I realised that the core conflict in this story was teenage personal freedom, that I was able to see what the stakes within the story were. Although I don’t think it is perfectly phrased, it does contain the three key elements required of the logline and gives a sense of the protagonist, their struggle with the antagonist and the stakes involved. 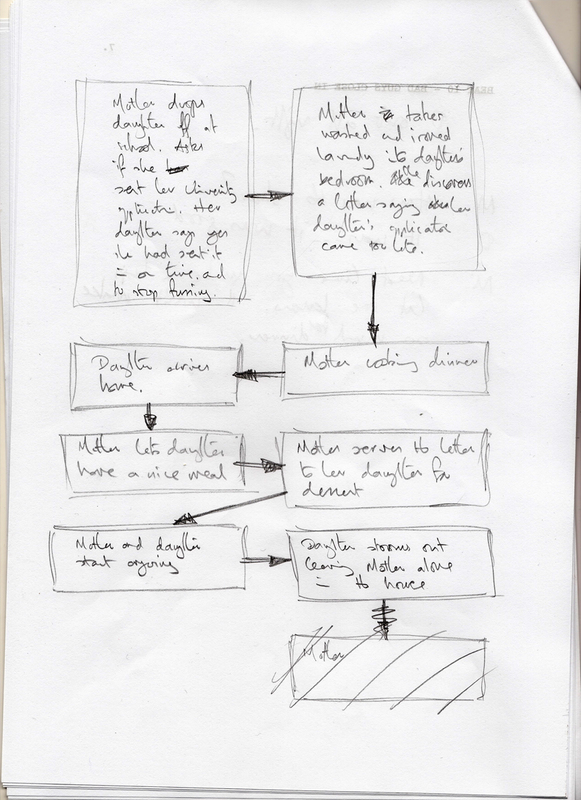 Taking the logline as the core, I drafted a rough outline for the story by sketching out a simple flow diagram of the key moments within the plot. A bit like a jigsaw. It didn’t have to be right at this stage. It just had to be complete. Using a flow diagram to sketch out the bare bones of the narrative in this way helped me to see visually what I had and what was missing in the original idea, and how well everything would fit together before committing to a more detailed step outline. I then prepared a more detailed step outline. The twelve steps within this outline are loosely based on Blake Snyder’s 15-point structure of beats (Snyder, 2005). What’s interesting about Snyder’s approach to screenwriting is its flexibility. The fifteen ‘beats’ correspond to the key moments within a screenplay and the order in which they occur. Each beat shows something happening to the main protagonist and serves to move the story forward. I began by looking at the first and last ‘beats’ – the ‘Opening Image’, which Snyder describes as ‘the very first impression of what a movie is – its tone, its mood, the type and scope of the film…a “before” snapshot’ (Snyder 2005, p.72) and the ‘Final Image’, which is ‘the opposite of the opening image. The proof that change has occurred and that it’s real’ (Snyder 2005, p.90). As this story is based on a conflict between a mother and daughter, I decided to open with an image of two characters, Mother and Daughter, together on a sofa, relaxed at the end of the day, and close with the opposite image of Mother alone on the sofa at the end of the day. Contrasting images of the same place, featuring the Mother figure in opposite states of mind. I then looked at the intervening steps of the story and how Snyder’s 15-point structure of beats might help inform the way in which I could write my first draft. The ‘Stated Theme’ beat was particularly useful when it came to shaping the opening scenes in the car. Snyder suggests that somewhere near the beginning ‘someone (usually not the main character) will pose a question or make a statement (usually to the main character) that is the theme of the movie…it will be conversational, an offhand remark that the main character doesn’t get at the moment – but which will have far-reaching and meaningful impact later’ (2005, p.73). This is great advice. I gave Daughter the line ‘Mam, will you stop fussing, and just let me be me’ in response to Mother’s nagging as she heads off to school. The phrase ‘let me be me’ serving as both a rebuff to Mother and a subtle reference to the theme of teenage personal freedom. I conflated the ‘Stated Theme’ beat with the ‘Set-up’ beat. The set-up, which corresponds to Act 1, the ‘beginning’ of the film, is where the characters are introduced to the viewer, and where ‘we exhibit every behaviour that needs to be addressed later on, and show how and why the hero need will need to change in order to win’ (Snyder 2005, p.75). In this story, we are introduced to the characters in a car on the way to school, in which we see Mother as domineering and Daughter as long-suffering and on the verge of resisting her mother’s wishes for her. The next beat, the ‘Catalyst’ moment, is a life-changing event ‘disguised as bad news’ (Snyder 2005, p. 77). Mother finds the letter saying her daughter has missed the university admission deadline. This is the moment she realises Daughter has lied to her. The moment in which Mother decides to confront Daughter’s deceit. The ‘Fun and Games’ beat was particularly enjoyable to work on. Snyder describes this part of the film as ‘where we aren’t as concerned with the forward progress of the story – the stakes won’t be raised until the midpoint – as we are concerned with having “fun” (2005, p.81). He also says that this is ‘the heart of the movie’ (2005, p.81) and the point at which ‘we take a break from the stakes of the story and see what the idea is about…I call it fun and games because this section is lighter in tone than other sections’ (2005, p.82). Taking Snyder at his work, I ‘played’ with the main idea that grabbed me in the original Humans of New York story, that of the mother serving up the letter as dessert. So I decided to develop a scene in which Mother was in the kitchen preparing the ingredients and assembling the dessert. This leads naturally to the ‘Midpoint’ and the ‘All is Lost’ beats, in which the midpoint is a ‘false victory’ and the ‘All is Lost’ is the opposite (Snyder 2005, p.84) – Mother lets Daughter have a nice meal, then serves up ‘dessert’ (‘false victory’), followed by the argument in which Daughter reveals her intention to go on a gap year with her friend (the All is Lost opposite). The story moves swiftly towards its conclusion in the ‘Dark Night of the Soul’ beat, the ‘”Oh Lord, why has thou forsaken me?” beat’ (Snyder 2005, p.88) in which Mother realises she has miscalculated in confronting Daughter, maybe even lost her. Daughter storms out of the house, leaving Mother alone. 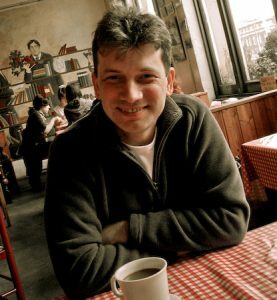 When it came to writing the end of the film, I found some useful advice in Patrick Nash’s book on writing short films: ‘In short films there is seldom much time for resolution scenes. It is often better to end on the dramatic climax, to go out on the ‘bang’ as it were’ (Nash, p.90). Drawing upon Snyder’s description of the ‘Finale’ beat, in which we see ‘the turning over of the old world and a creation of a new world order – thanks to the hero’ (2005, p.90), the story ends on a dark note, with Mother alone in the house. I have left it open-ended, in that we don’t know what will become of Mother and Daughter. Though we are aware that things may never be the same again. I found the process of working from logline to step outline to first drafts a very effective way of shaping the script. Resisting the temptation to jump straight in and write the first draft, pinning the idea down with a logline was a great way of thinking through and refining the idea in terms of the story’s protagonist, struggle and stakes. It’s not something I have tried before. Preparing a step outline helped provide a road map for writing the first draft. When it came to writing the first draft, I followed the flow of ideas within the step outline, letting my imagination and the characters take over. This part of the filmmaking process has been a fascinating experience. I’ve used a few techniques I haven’t tried before. Writing a logline and step outline before working on the script has particularly valuable. Techniques I will continue to use when working on future moving image projects. 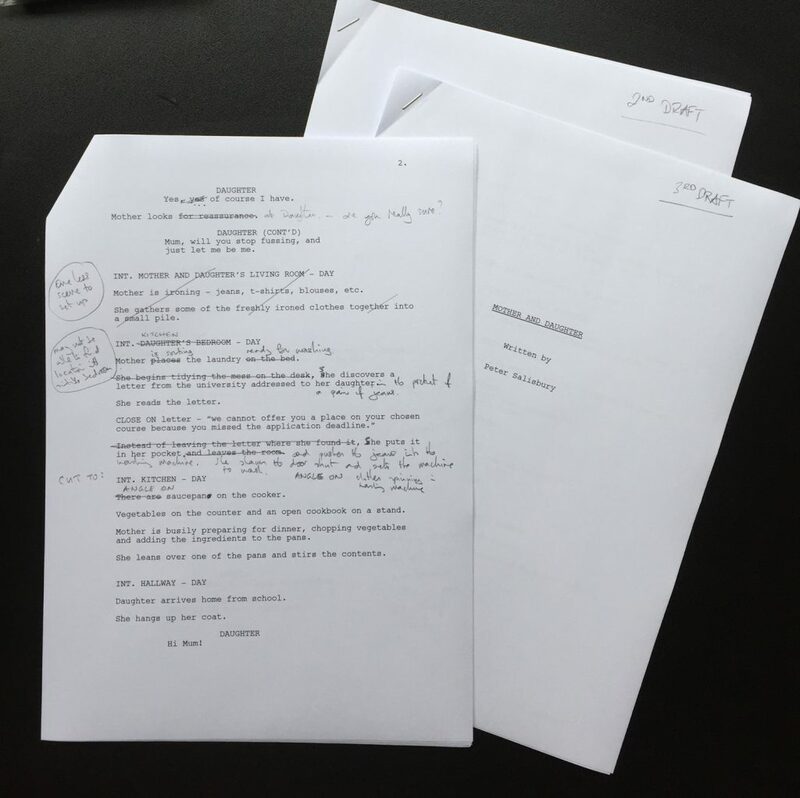 However, finding, developing and writing the script has taken almost two months. Considerably longer than I had expected. I had hoped to have completed the film by early August.